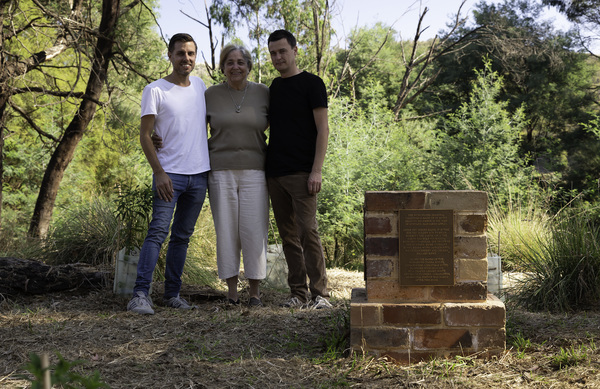 Sydney-based Wiradjuri-Kamilaroi artist Jonathan Jones, Senior Wurundjeri Elder, Aunty Joy Murphy Wandin AO, and Melbourne-based Celtic-Australian artist Tom Nicholson at Coranderrk Aboriginal Station. A public art project that marks the historical boundary of Coranderrk Aboriginal Station, one of Australia’s most significant sites, was officially opened to the public on Monday 15 April. untitled (seven monuments) has been created by Senior Wurundjeri Elder, Aunty Joy Murphy Wandin AO, Sydney-based Wiradjuri-Kamilaroi artist, Jonathan Jones and Melbourne-based Celtic-Australian artist, Tom Nicholson. Working with local landowners, historians and local and state government agencies, seven monuments have been installed throughout the region of present day Healesville to delineate the boundaries of Coranderrk Aboriginal Station when it was at its largest, in 1866, at some 4,850 acres. Each marker comprises an upturned flagpole and brick footing, with a plaque on each face, surrounded by Coranderrk (Christmas bush). 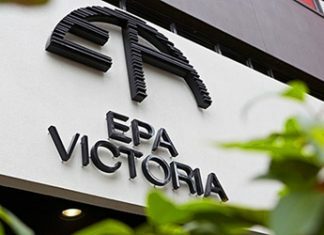 Established by Wurundjeri people and other displaced Aboriginal people in 1863, Coranderrk Aboriginal Station quickly became both a thriving economic community and a powerful base for Aboriginal self-organisation and political advocacy. Coranderrk was progressively sub-divided by the Victorian Government, ultimately leading to the dispersal and forced removal of the community to Lake Tyers in 1924, leaving only a handful of determined elders. Today Coranderrk continues to be an important living place for Wurundjeri and for the wider Aboriginal community. untitled (seven monuments) invites the public to move between these markers to learn about Coranderrk’s extraordinary history and traverse Wurundjeri country. TarraWarra Museum of Art Director, Victoria Lynn, said the project stemmed from a collaborative exhibition by Aunty Joy Murphy Wandin, Jonathan Jones and Tom Nicholson, titled Future Memorials, which was presented at the museum in 2013-14. “Future Memorials explored the effects of colonialism and sought new ways to understand and renew the relationship between these histories and the present,” she said. “Some of these bricks, which were collected from citizens in and around Healesville, now form part of the brick footing of each of the seven monuments in this project,” said Ms Lynn. The other large-scale installation featured in Future Memorials was untitled (shield design) by Jonathan Jones in consultation with Aunty Joy Murphy Wandin, which presented a corridor of yellow light in the Museum’s Vista Walk gallery. The conceptual basis for the design of this work was the wooden parrying shield made by William Barak in 1897 which features a distinctive carved diamond pattern. The colour of the light refers to Barak’s and his father’s prediction of their own death who both stated that they would pass when the muyan (wattle) bloomed. Like a shield, Ngurungaeta (cultural leader) Barak, was steadfast in his campaign for the rights and protection of his people, promoting the strength and legitimacy of his community at Coranderrk, while maintaining their cultural heritage. untitled (seven monuments) continues the artists’ meditation on the nature of the monument itself, as a tradition closely linked to colonialism, and on the possibilities of new kinds of public art making.